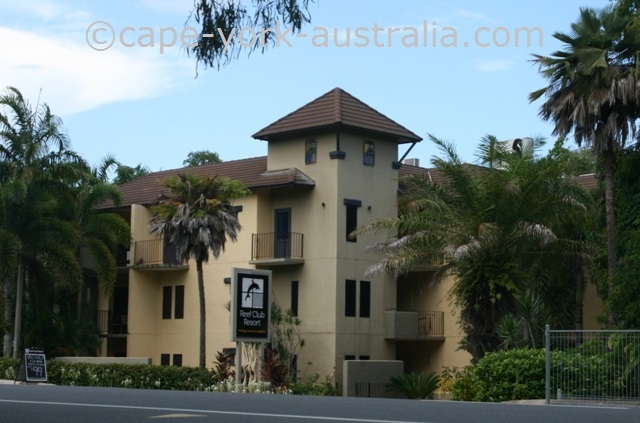 On this page you have Port Douglas accommodation. There is a lot of it, and it is excellent. 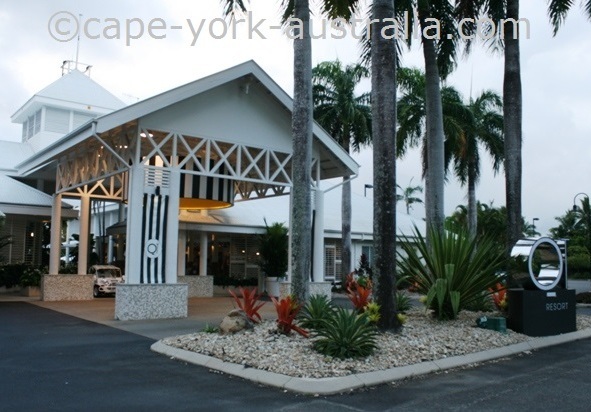 The town is full of luxury hotels, resorts and holiday apartments, but there are also a few bed and breakfasts and backpacker hostels, and if you are a Cape York traveller, you are probably looking for a motel or a caravan park. On the pages below are most of the places, the full lists with prices, addresses and contact details is always in the Destination Guide. 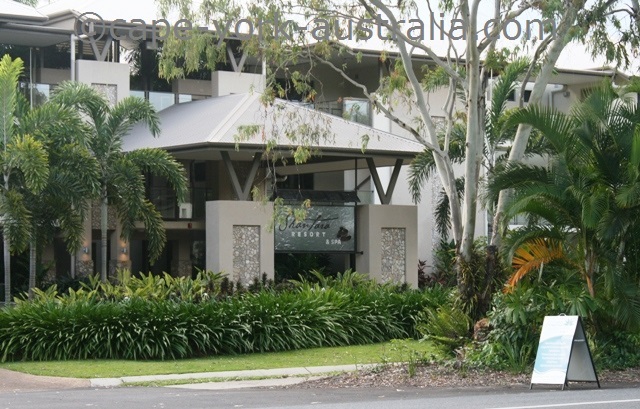 Port Douglas hotels are mostly four and five star luxury and expensive accommodation. Some have one, others have two or three room units. 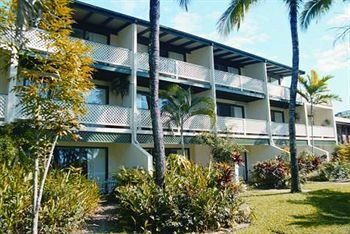 Most have balconies with views, and most are located in central Port Douglas (some also further south and close to the beautiful Four Mile Beach). 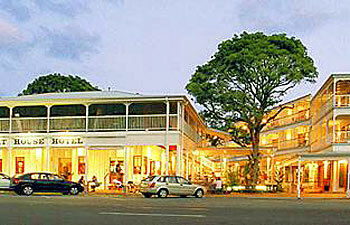 There is a huge amount of resorts in Port Douglas. There are the ones that are central - right in and around Macrossan Street, and there are also the ones that are a bit further south; and quite many huge and excellent establishments in the southern end of the town. There are also a lot of excellent holiday apartments. These are mostly very central, or right south of the town centre, there are not that many in the southern parts of the town. They are great places to stay and affordable if shared between a few couples. 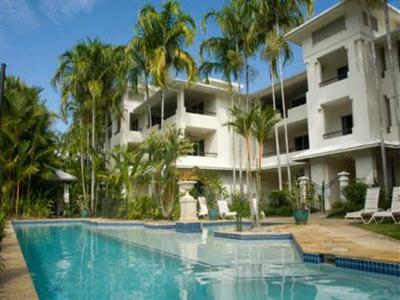 There are also some holiday villas amongst all the excellent Port Douglas accommodation. They are all very centrally located with most being situated in or right in the blocks around Macrossan Street. Very few are a little further south, but none are in the southern end of the town. 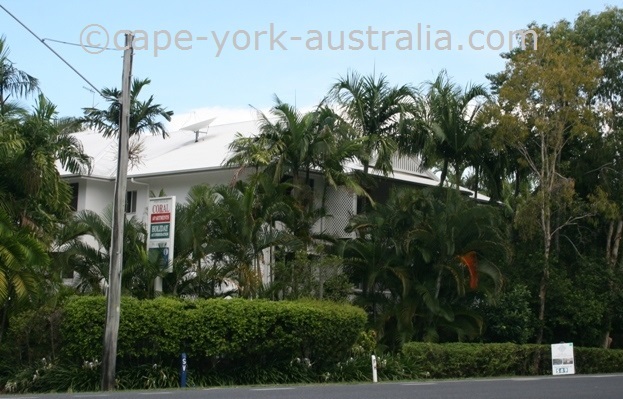 There is also a good amount of bed and breakfast, some are in or close to the town centre, but there are also the ones that are further south and closer to Four Mile Beach. Some are also outside the town, which does not need to be a bad thing - they may just offer even more nature and privacy. 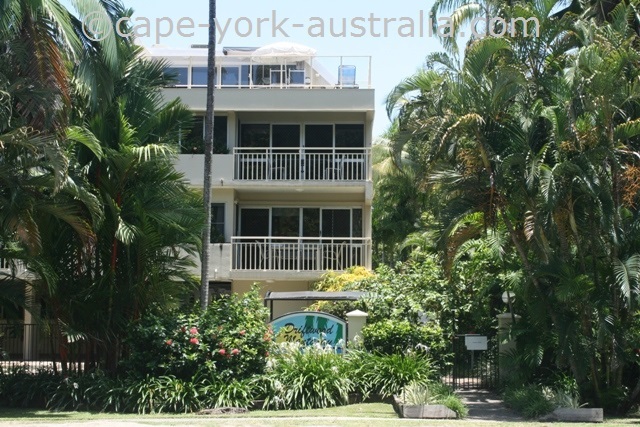 It is not very easy to find budget accommodation in Port Douglas, but if you look around well enough, there are actually a few options. There are nowadays some backpacker hostels in town, most are centrally located, clean and nice places to stay for young travellers. Another option that is cheaper than luxury accommodation is motels. 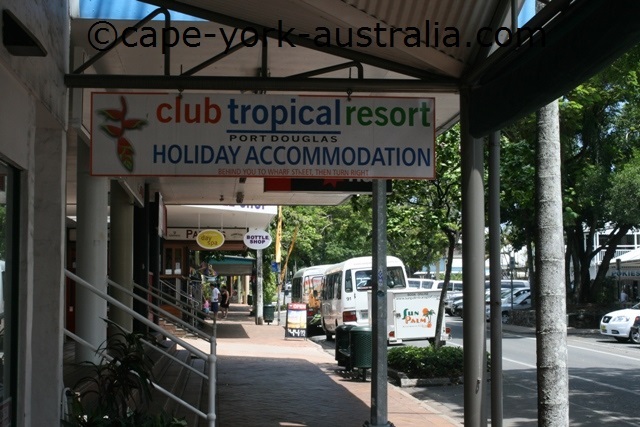 There are not as many choices in town, but there is at least one that is more central, and then there is the Lazy Lizards further south that has parking in front of each unit - handy for travellers doing a Cape York trip. 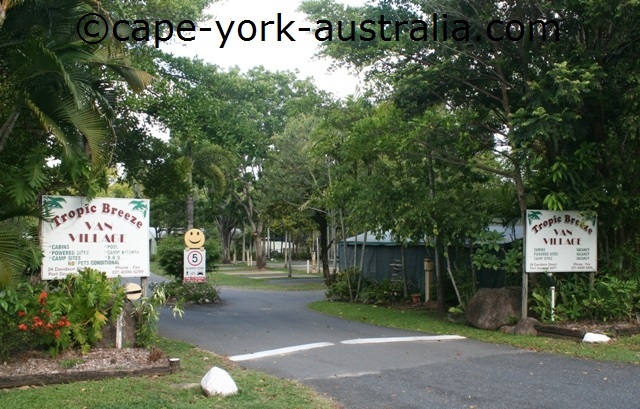 But the handiest for Cape York travellers is of course a caravan park, because obviously you are already on a camping trip. There are two in town that are quite central, and there is one outside. And there is also a small camping ground in the back of Dougies Backpackers but it is small. 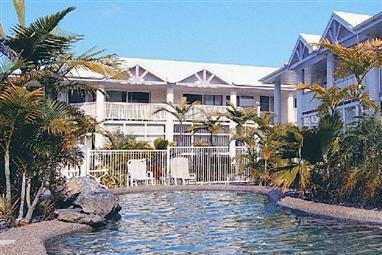 On this page you have the hotels in Port Douglas. They are sorted after location, meaning the higher up on the list, the more central is the place. And that does not mean that the places lower down on the page are not worth a look. They may be less central but closer to the beautiful Four Mile Beach. 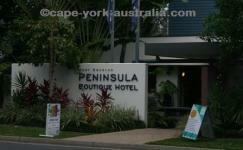 Below the list are also links to other pages such as Port Douglas resorts and holiday apartments. This four star hotel is in Macrossan Street. It has 16 one bedroom apartments with kitchenettes, internet, TVs and DVD players, and a balcony with either city or garden views. In the gardens there is a swimming pool, and a terrace with a BBQ and an entertainment area. Mantra Heritage has standard rooms, apartments, suites and deluxe rooms. All units have tea and coffee making facilities and apartments have kitchens. There is a minibar, internet, TV, DVD player and a safe. In the tropical gardens there are two pools, a spa, a gazebo, a BBQ area and a cafÃƒÆ’ƒÃ‚© and a restaurant. 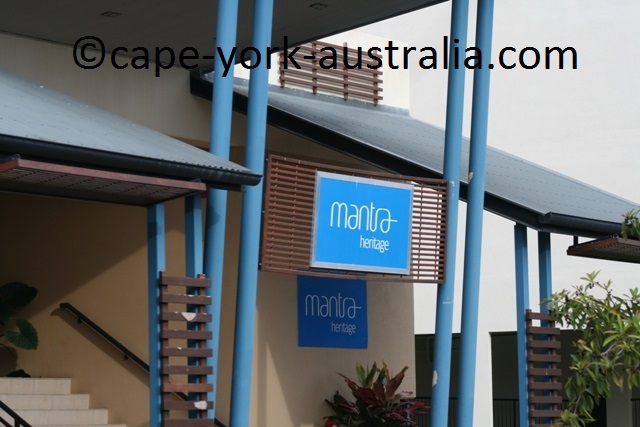 Mantra in the Village has 21 one and two bedroom apartments with kitchenettes, TVs and internet. In the garden there is a terrace with a BBQ area and a Mediterranean pool. There is laundry service, babysitting service and a business centre where you can do office work including scan and fax documents. The four and a half star Peninsula Boutique has 34 luxury suites with kitchenettes, bathrooms, spas and private balconies. There's free room service and free airport shuttle. In the gardens is a coffee shop, a bar and a restaurant. 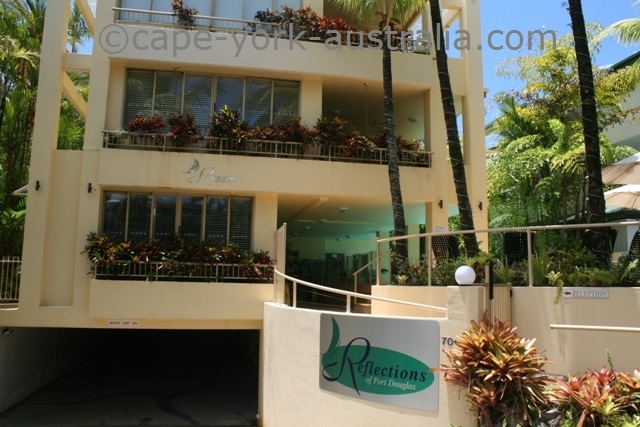 The four and a half star luxury Reflections contains two and three bedroom fully self contained apartments with fully equipped cooking facilities, all laundry facilities, Austar TV, a CD and DVD player, a stereo, in-room safes, and two bathrooms, some with spa. Marina Terraces has 17 fully self contained holiday apartments with one or two bedrooms, fully equipped kitchens, TVs with over 60 channels, ceiling fans and a/c, and private balconies. In the tropical gardens there is a BBQ and entertainment area, and a saltwater swimming pool. The three and a half star At The Mango Tree has 19 rooms with fully equipped kitchens, private balconies, internet access, TVs and DVD players, and room service and laundry facilities at extra cost. In the complex there is a swimming pool, a spa, BBQs and a tennis court. The five star Sheraton Mirage has 100 two-storey villas and 295 luxury rooms and suites with cable TVs, mini bars, and all modern amenities. There is a gym, a sauna, tennis courts, a golf course, a pro shop and a few swimming pools. There is also a pool bar and an on-site restaurant. 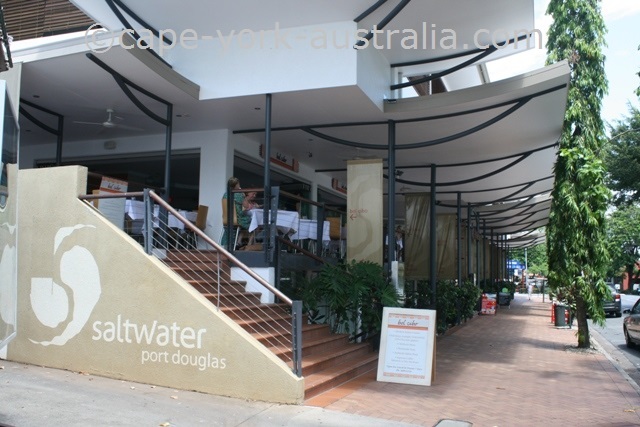 On this page you have Port Douglas resorts. And there are a lot of them! On this page they are sorted accroding to their location - the higher up a place is on this page the closer it is to the town centre. And that does not mean that the places in the end of the page are not worth looking at. Some are fantastic places, way larger than some more central ones, with everything you ever need, so you don't even need to go to the town. They definitely have their upsides, and you may well get better value for your money. 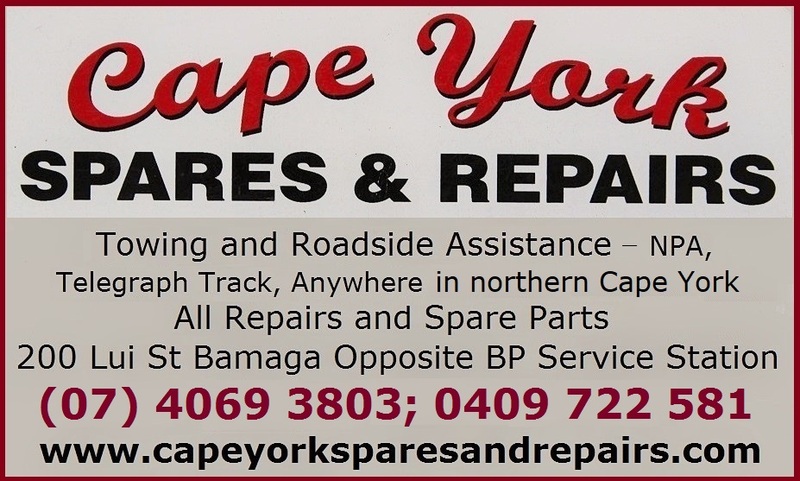 The following places are located in, around and north of Macrossan Street. Club Tropical has 51 one, two and three bedroom apartments with fully equipped kitchens, TVs, internet access and safe deposit boxes. There is a sauna, a spa and a swimming pool with a waterfall in tropical gardens. The four star Mantra on the Inlet has standard rooms and apartments. The rooms have tea and coffee making facilities, TVs, DVD players and safes. The apartments have fully equipped kitchenettes, spas, and balconies with views and access to a pool and a BBQ area. The four star Regal has standard and deluxe rooms and two bedroom apartments with kitchenettes and tea and coffee making facilities, internet, TV, CD and DVD players, and a private, indoor spa. In the tropical gardens there is a BBQ terrace, a spa, and a swimming pool with a tropical waterfall. The four and a half star Mantra Aqueous has standard rooms, one and two bedroom apartments and suites with tea and coffee making facilities. There is also internet, a safe, a desk, a private bathroom and a balcony with access to a swimming pool. There is a spa, a cabana and a sundeck. 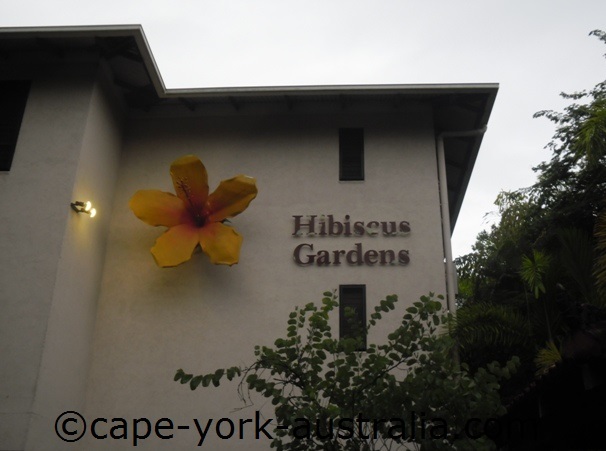 The four and a half star Hibiscus has 68 standard rooms and suites that are fully self contained with fully stocked kitchens, TVs, phones, private balconies, safe deposit boxes and high speed internet. In the garden there are walking tracks, a spa and a swimming pool. The Meridian has studios, two bedroom units and ground level apartments with tea and coffee making facilities, internet, phones, TVs, safes and private bathrooms. 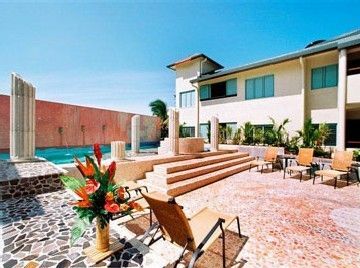 There are tropical gardens with a spa, Jacuzzi, a heated pool and BBQ entertainment area. There's also massage and an onsite restaurant. 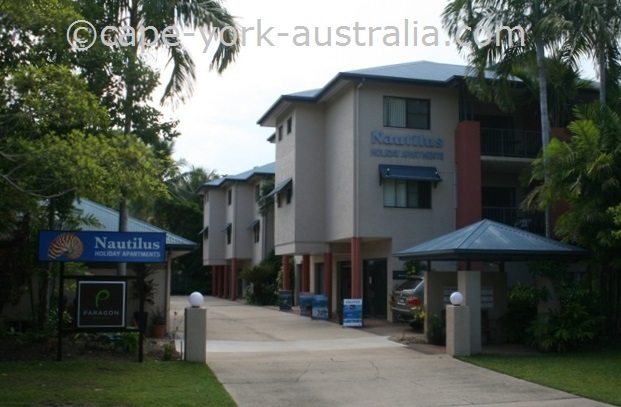 The following Port Douglas resorts are located between Mowbray Street in the north and Mahogany Street in the south. All but one are actually north of Port Street - still walking distance to the town centre. Peppers Beach Club has 113 one, two and three bedroom units with fully equipped kitchenettes, mini bars, private bathrooms, TVs, DVD players, high speed internet, ironing boards and irons. There is a swimming pool, a spa, a sundeck and tennis courts. The five star Shantara has one bedroom luxury apartments with a king size bed, a private bathroom, a modern living area, a private balcony and a kitchen with a tea and coffee maker and a microwave. There is a garden with a terrace, two outdoor swimming pools, a day spa and a gym. 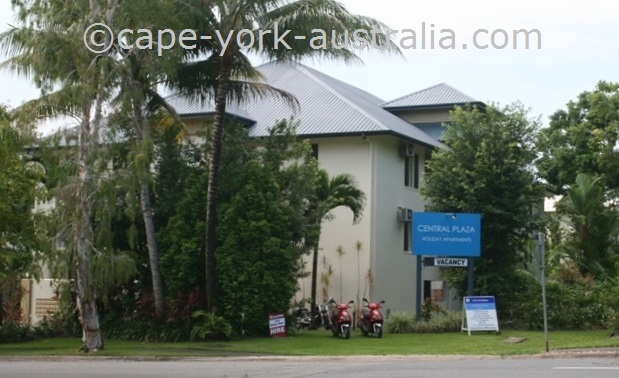 Central Plaza has one, two and three bedroom self contained and beautifully furnished apartments with kitchenettes, private balconies, TVs, internet, and lap top computers available for hire. There is a swimming pool, an outdoor spa, a BBQ area and a children's playground. The four star Freestyle has 31 one and two bedroom apartments. The units have self contained kitchens, TVs, DDD phones, and a private balcony. There is a library, and internet is available for a fee in the lobby. In the gardens there is a swimming pool, a spa and BBQs. 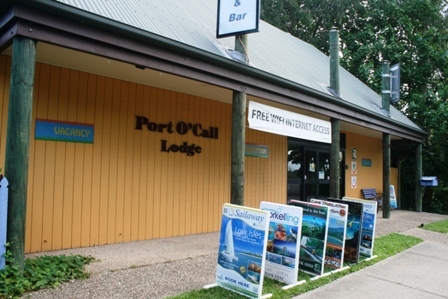 The Port Douglas Reef Club has kitchenetteswith fridges, private bathrooms, hair dryers, satellite TVs, DVD players, internet. In the garden there is an outdoor swimming pool, Jacuzzi, and a picnic area with tables. There is luggage storage and a laundry. 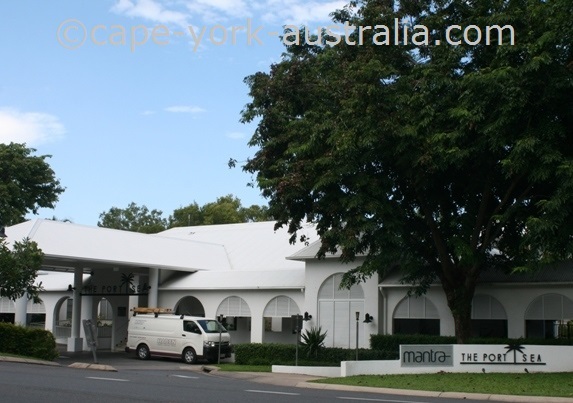 The four star Mantra Portsea has 145 standard rooms and suites. All the rooms have kitchenettes, mini bars, TVs, internet and balconies with views. In the complex there is a spa, a gym, tennis courts, a plunge pool, a lap pool, a lagoon style pool and a swim-up bar. 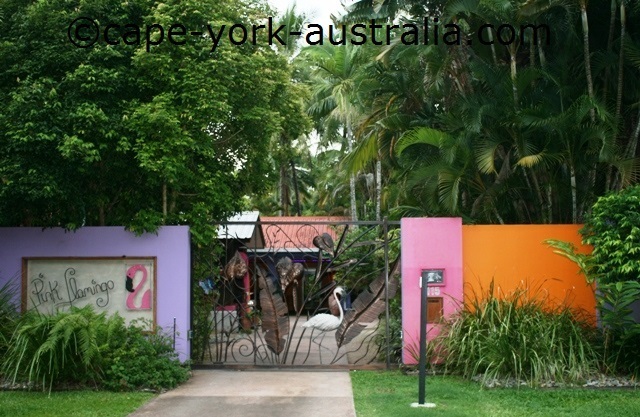 The colourful Pink Flamingo has air conditioned rooms with fridges, microwaves, coffee and tea making facilities, satellite TVs, CD and DVD players, private toilets and bathrooms, hair dryers, and private terraces. 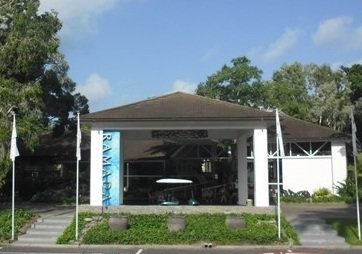 There is internet, massage, bicycle rental, a poolside bar, and a picnic area with tables. The four star Sands has 52 one and two bedroom apartments with a private patio, a fully equipped kitchen, a phone, internet connection, a TV, in house movies, a laundry hookup, iron and board. In the garden are exotic plants, a spa, a swimming pool and a BBQ area. 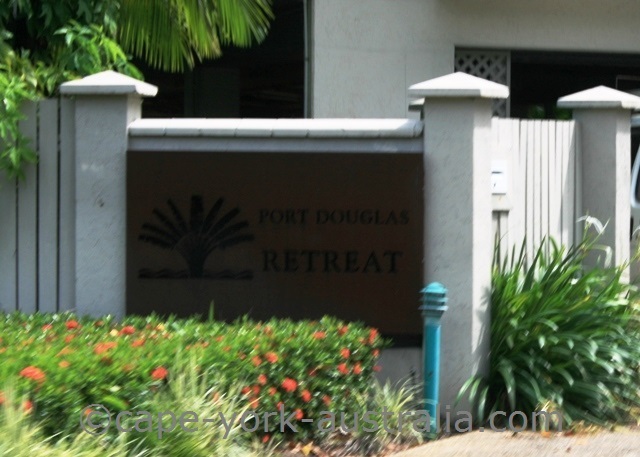 The following Port Douglas resorts are located south of the Mirage Country Club. The four and a half star QT has 192 standard rooms and apartments. All units have TVs, CD and DVD players, internet, hair dryers, safes and ceiling fans. Apartments also contain cooking facilities. There is a gym, and in the gardens there is a spa, a swimming pool, a pool bar and a restaurant. 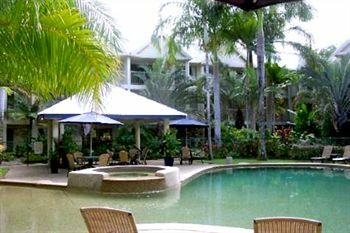 One of the oldest of all Port Douglas resorts, the luxury Rendezvous Reef Resort has large ensuite rooms with kitchenettes, in room dining and lounge areas, private terraces, TVs and internet. In the complex there is a swimming pool, bicycle hire, babysitting and a bar and a restaurant open for breakfast, lunch and dinner. The Pool is a four and a half star luxury resort with 70 self contained apartments with kitchens, TVs, internet, laundries, and some apartments with private pools, and others with a direct open access to the 180 metre resort pool. There is also massage and spa. 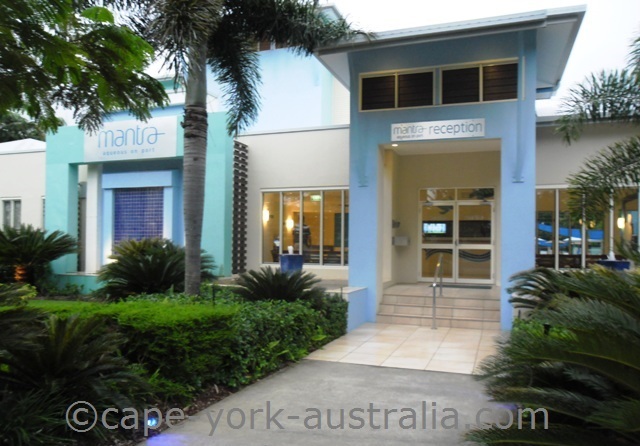 Mantra Links is close to Four Mile Beach. It has one, two and three bedroom apartments with fully equipped kitchens, TVs, CD/DVD players and balconies with garden or ocean views. In the gardens there is a tennis court, a golf club, a BBQ area, a spa and a restaurant. 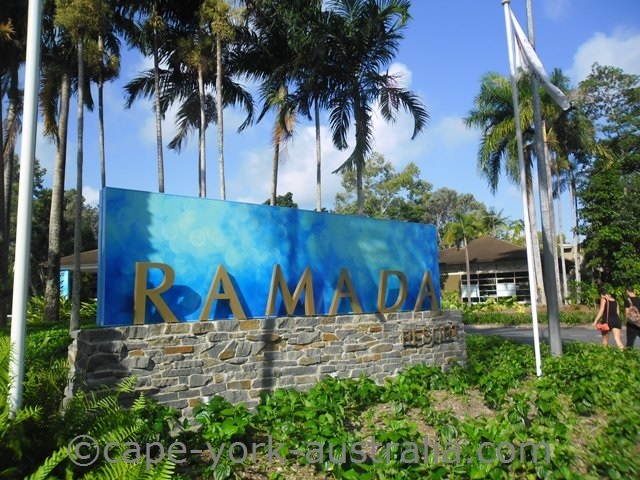 Ramada has 224 standard rooms and suites with private bathrooms and balconies, internet and safe deposit boxes. 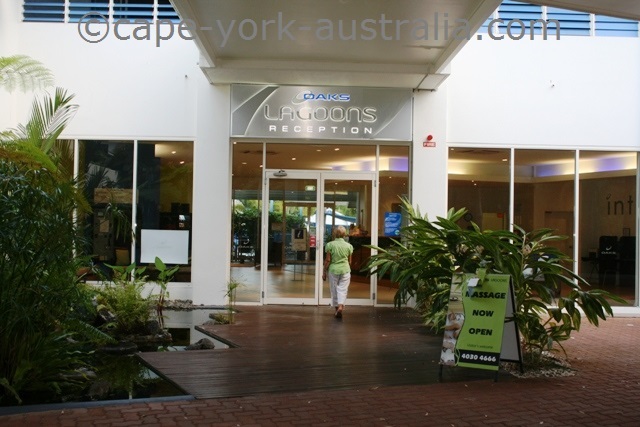 There is a lagoon style pool, a poolside bar, massage, a spa, a lounge, tennis courts, a gym, a conference centre, two restaurants and a snack shop. Oaks Lagoons has studio rooms and one and two bedroom apartments with king size beds, tea and coffee making facilities, TVs, DVD players, a/c, ceiling fans, a spa, a plunge pool and balconies. In the complex there is a full kitchen, a dining area, a lounge area, BBQs, a pub, massage and laundry. Seion at Bale has three bedroom apartments with kitchens, modern living rooms, a terrace with a day bed and private heated pools. There is a golf course, a tennis court, a fitness studio, a restaurant, and body treatments including massage in day spa. Nimrod has 51 one, two and three bedroom units with a kitchenette, private bathroom and balcony, TV, video games, internet and DVD player. In the five acre tropical gardens there is a swimming pool, a terrace with BBQ facilities, a spa, childern's playground and a tennis court. Room service and laundry available at extra cost. 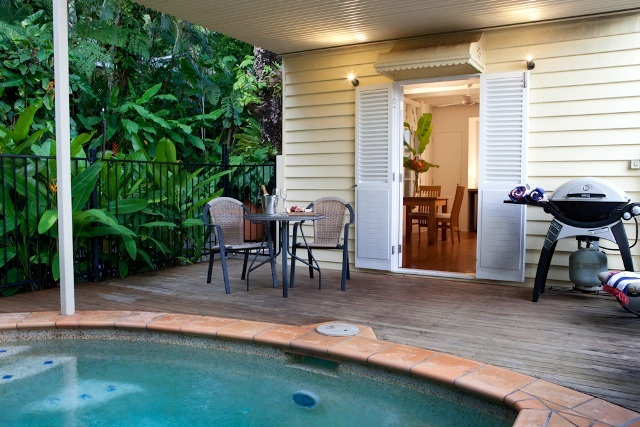 Peppers Bale is one of the most amazing five star luxury Port Douglas resorts with one, two, three and four room sanctuaries with a private pool, a poolside pavilion with day bed, and full kitchen and living facilities. 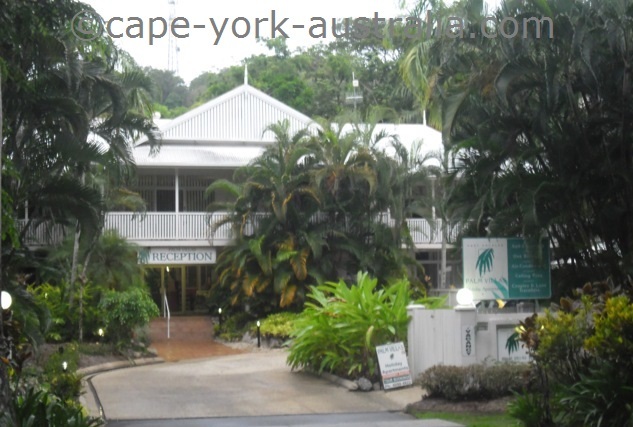 There is massage, beauty treatment and an on site restaurant in the 15 acres of beautiful lush tropical gardens. 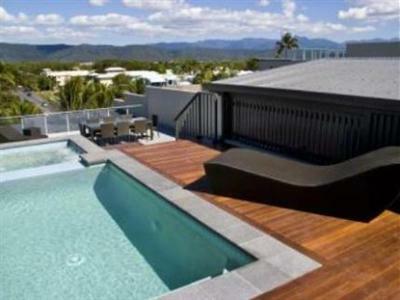 This five star and one of the largest of all Port Douglas resorts has 194 luxury one and two bedroom apartments with a swim-out terrace to the communal swimming pool. Room and laundry service are available at extra cost. There are BBQs, a restaurant and two bars. 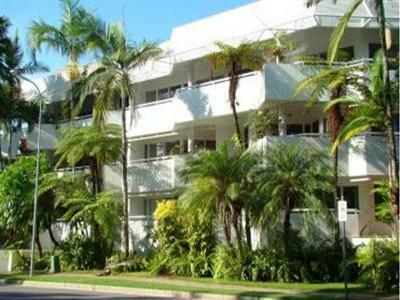 On this page you have Port Douglas holiday apartments. And there is lots to choose from! As opposed to the resorts, many of which are also found in the southern parts of the town, the apartments are mostly central, and they are great places to stay. On this page they are listed according to their location, with the most central ones highest up, and this does not mean that the ones in the end of the page are not worth a look. Many of the southern ones are close to the beautiful Four Mile Beach. 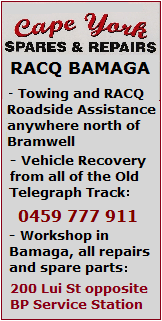 The following places are located in and around Marcrossan Street, all north of Mowbray Street. 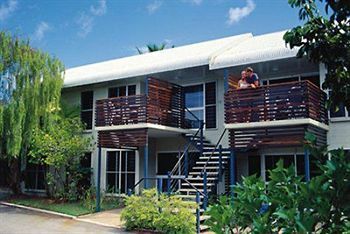 The four and a half star Saltwater, with a great location on Macrossan Street has one and two bedroom apartments with cable TVs, DVD players, private bathrooms, kitchen facilities including a dishwasher, and access to an outdoors swimming pool, sundeck and BBQs. 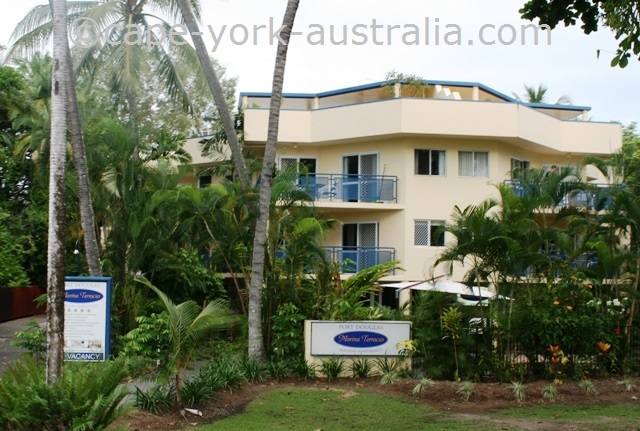 These are four star studio, one and two bedroom self catered Port Douglas holiday apartments with private terraces and spa baths, internet, TVs, DVD players and safes. Studios have tea and coffee making facilities and a fridge while apartments have full kitchens. There is a BBQ deck, a spa and a lap pool. 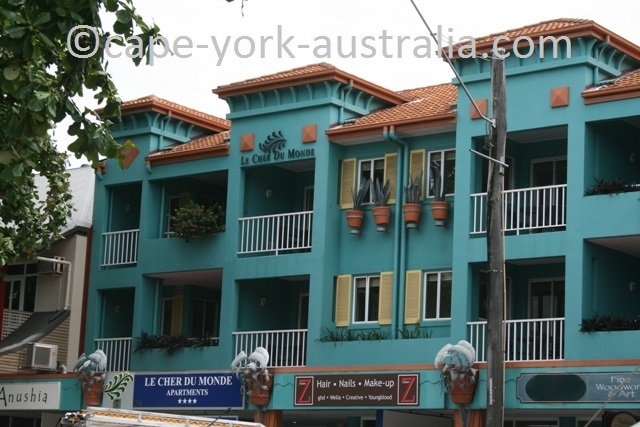 Like the two places above, Le Cher du Monde is in Macrossan Street. There are 27 one and two bedroom apartments with king size beds, private bathrooms and internet. In the garden are BBQs, a restaurant, spa and swimming pool. 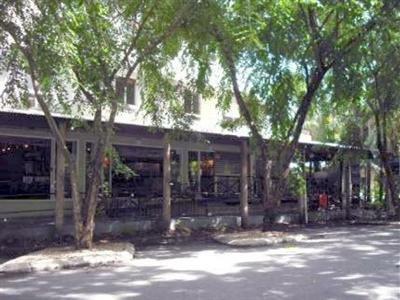 The four star Martinique is in Macrossan street. It has 19 one bedroom apartments with kitchenettes, mini bars, internet and private balconies. There is a spa and an outdoor swimming pool, a pub in the lobby, a golf course and a tennis court. 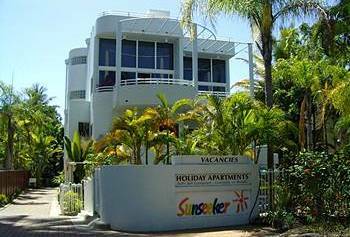 These Port Douglas holiday apartments have full kitchens, in doors dining areas, TVs, CD and DVD players, internet, air conditioning, baths or showers, hair dryers, laundry facilities and service, and luggage storage. In the garden is a BBQ and a picnic area with tables. This great place is next to the beach on the Esplanade. The apartments have full kitchens, in doors dining areas, TVs, CD and DVD players, room service and spa baths. In the garden there is a swimming pool, Jacuzzi, a massage and beauty centre, tennis courts, and a picnic area with tables. This is a beautiful place with one, two and three bedroom apartments with fully equipped kitchens, laundries, living rooms with TVs, DVD players and high speed internet; and balconies with private BBQs. There is a swimming pool and a spa, in the tropical gardens. By the Sea is right next to the beach on the Esplanade. There are 22 one or two bedroom self contained apartments with private balconies, BBQs, TVs, laptop computers and high speed internet. There is also a saltwater swimming pool, BBQs and a sundeck. The luxury five star Coconut Grove has 33 one and two bedroom self contained apartments with private pools, spas and BBQs. 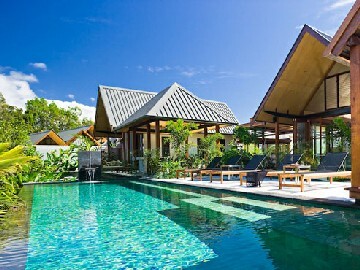 There is also a common lagoon style swimming pool and a lap pool. 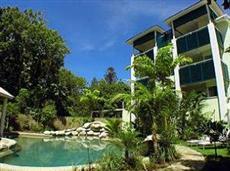 There is also a safe, laundry service, massage and tennis court in the tropical gardens. 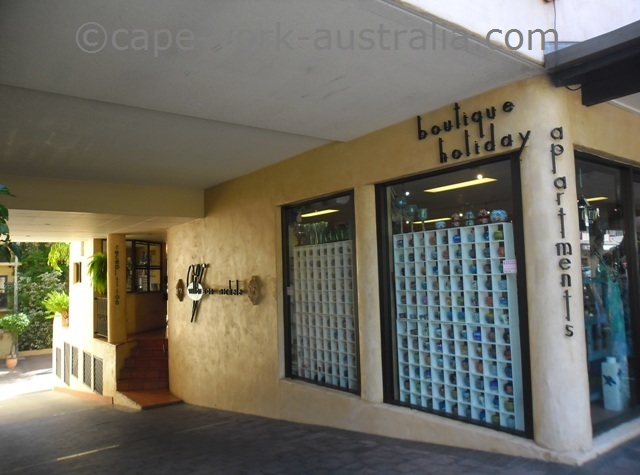 The four and a half star Verandahs Boutique is in central Port Douglas near Macrossan Street. They are self contained with all modern facilities, fully equipped kitchens and private balconies with BBQs. Downstairs is a heated outdoor swimming pool. The four star Latitude 16 Driftwood Mantaray has 27 fully self contained apartments with TVs, DVD players, kitchenettes with microwaves. In the gardens are a spa and a swimming pool. There is laundry service and off street parking. The Latitude 16 Tropical Reef has 16 fully equipped apartments with kitchenettes, TVs, air driers, ironing boards, safe deposit boxes and room service. There is high speed internet, and in the gardens is a spa, a swimming pool and off street parking. Latitude 16 Sunseeker has kitchenettes with fridges, microwaves and tea and coffee making facilities; TVs, CD players, and laundry service. There is massage, a spa, a swimming pool, a BBQ area and off street parking. The Beach Terraces has 20 one, two and three bedroom apartments with kitchens, TVs, DVD players, safe deposit boxes, laundry hookups and private bathrooms. There are different kinds of swimming pools as well as a sundeck, a patio and an on-site restaurant. 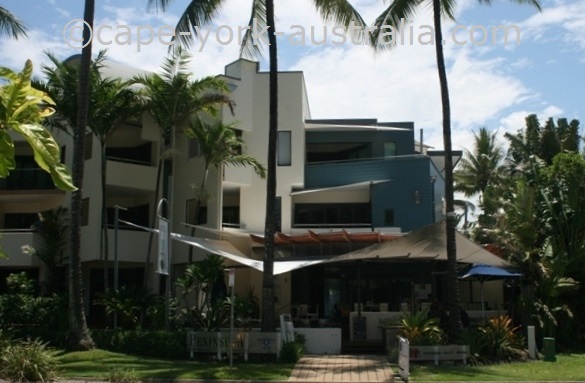 Latitude 16 Beachfront Terraces are two bedroom apartments on the beach front. 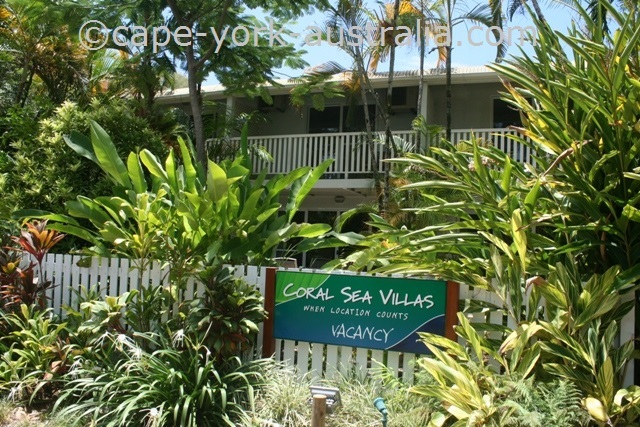 Completely self contained, they have fully equipped kitchenettes, TVs, hair driers and sea views. Ironing, laundry and room services are available for an extra fee. In the gardens there are a spa, a swimming pool and tennis courts. The four star Latitude 16 Mowbray by the Sea have fully equipped kitchens, TVs, DVD players, safe deposit boxes and large balconies with views of parklands. There are BBQs, a swimming pool and a spa, massage, laundry and parking. 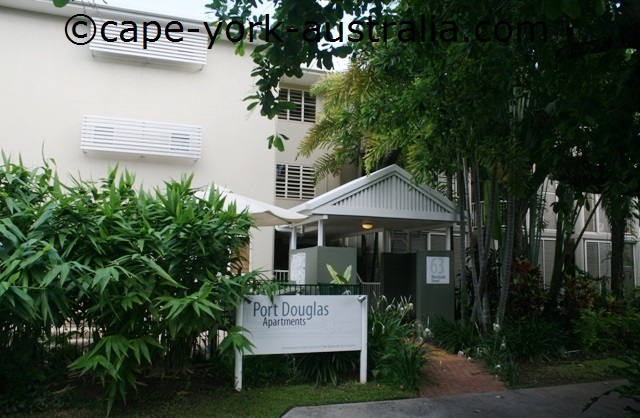 The following Port Douglas holiday apartments are located south of Mowbray Street. The higher up on the list, the closer the place is to the town centre. 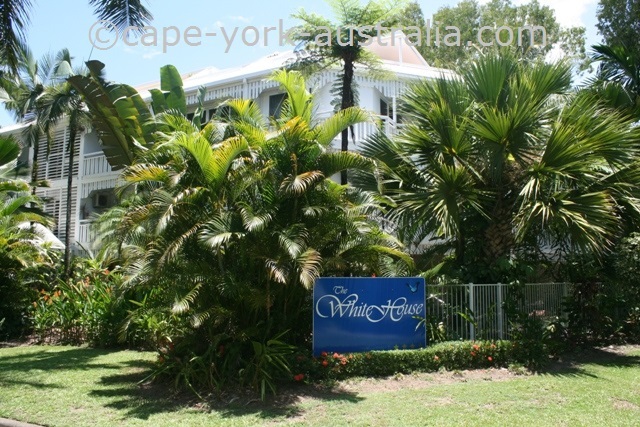 The four star Whitehouse has all modern amenities, TVs, CD and DVD players, air conditioning, safe deposit boxes and fully equipped kitchen. There is laundry service, massage, internet, free parking and a swimming pool. Those are comfortable self contained studio as well as one to two bedroom apartments with kitchen and laundry facilities, and a private balcony or patio area. 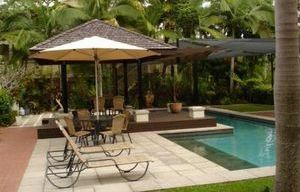 In the garden there is a saltwater swimming pool with a gazebo and a BBQ area. The four star Latitude 16 Tropic Sands has standard and deluxe rooms with kitchenettes, TVs, IDD phones, safes and private balconies. There is massage, tennis courts, a spa, swimming pool, swim-up bar, a terrace with BBQs and a pub. 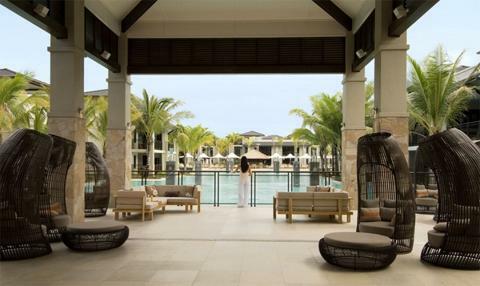 The five star Mandalay Luxury Beachfront is excellent. There are standard rooms as well as one and two bedroom apartments. The apartments have fully equipped kitchens, rooms have kitchenettes. All units have TVs, internet, and DVD players. 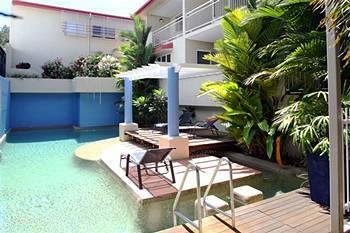 Downstairs are tropical gardens, a sundeck and a swimming pool. The four star Latitude 16 Coral has TVs, CD and DVD players, internet access, fully self contained kitchenettes with fridges and microwaves, and private balconies / terraces. There are safe boxes, outdoors swimming pool, and off street parking. These four and half star two and three bedroom apartments have spacious living areas, fully equipped kitchens and laundries with microwave, dishwasher, washing machine and a dryer; two bathrooms and balconies with garden views. In the gardens there is a BBQ and a swimming pool. 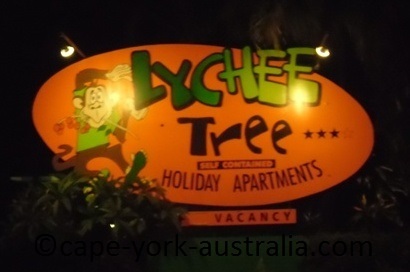 Lychee Tree has 18 one and two bedroom apartments with TVs, kitchenettes, laundries, internet and private balcony. There are tropical gardens with walking tracks, a lounge, a spa, a swimming pool, a kids' pool, a playground, a terrace with BBQs, and a restaurant. These are four star studio, one, two and three bedroom apartments with TVs, DVD players, internet connection and kitchenettes equipped with all modern appliances. 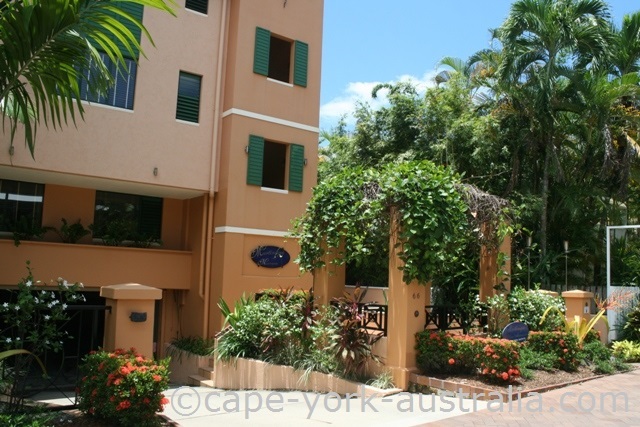 There is a tropical garden with walking tracks, a swimming pool, and sundeck and a BBQ area. These are one and two bedroom apartments with kitchenettes, private bathrooms, TVs, DVD players, internet, laundry hookups and patios. In the lush tropical gardens there is a terrace with a BBQ area, a Jacuzzi spa and a lagoon style swimming pool. The four star Dreamcatcher has one or two bedrooms and one or two bathrooms. They are fully self contained and equipped with kitchenettes, mini bars, and high speed internet. There is even a business centre, an onsite restaurant and a private beach. 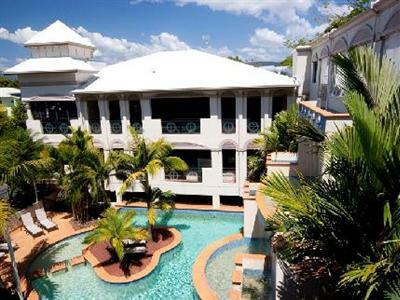 On this page you have Port Douglas villas. They are sorted after location - the further up the page, the closer the place is to the town centre and Macrossan Street. This does not mean that the places further down the place are not worth a look - instead of the town centre many of them are close to the beautiful Four Mile Beach. 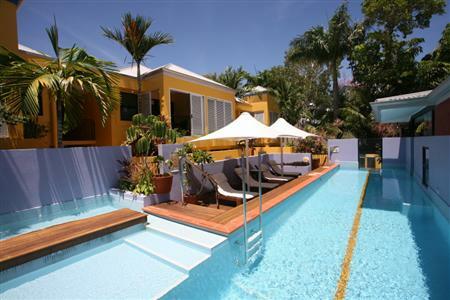 The four star Villa San Michele is in the middle of Macrossan Street. It has 40 one and two bedroom apartments with private balconies, bathrooms, TVs, DVD players, internet and fully equipped kitchens. 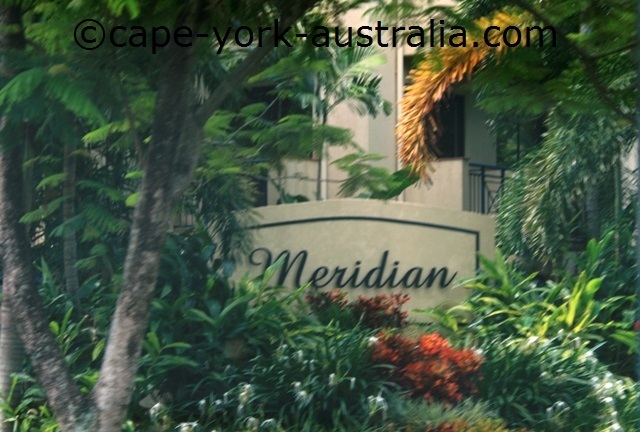 There are extensive gardens with ponds and walking paths as well as an outdoor swimming pool. 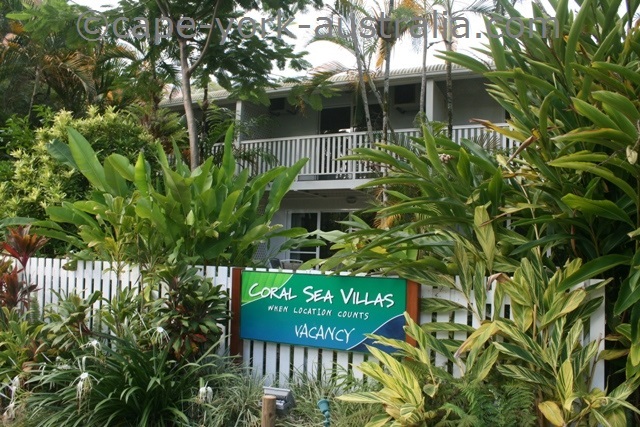 Coral Sea Villas is in the Esplanade end of Macrossan Street. It has nine multi level fully self contained holiday villas with fully equipped kitchens, laundries, and lounge rooms with TVs and DVD players. There is babysitting service, and prams, cots and baby chairs for rent. 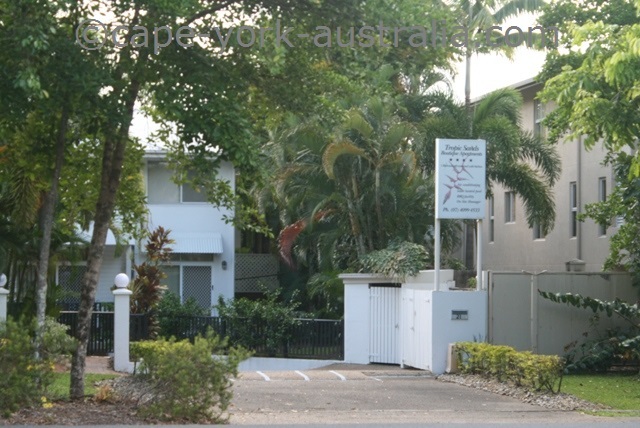 Palm Villas is one street back from Macrossan Street. It has large one bedroom fully self contained villa apartments with kitchenettes, TVs, balconies and living areas. There is a swimming pool, BBQ area, and entertainment area by the pool. 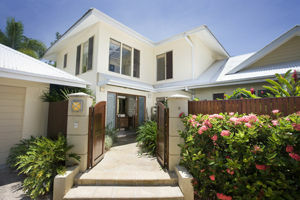 The luxury, five star Cayman Villas are two streets back from Macrossan Street. It has one, two and three bedroom apartments with spas, TVs, a private balcony and internet. There is a swimming pool, Jacuzzi, gym, massage, a sundeck, BBQs and gazebo by the swimming pool. 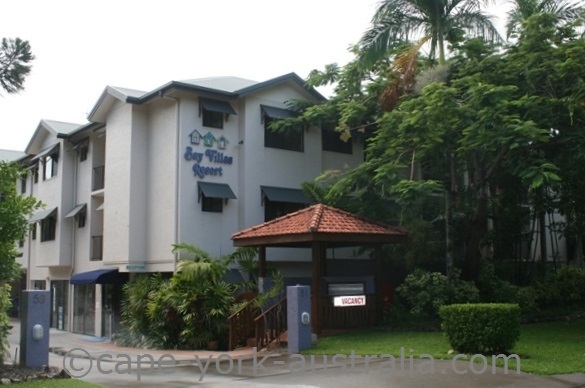 The four star Bay Villas is further down on Davidson Street but still walking distance. It has one, two and three bedroom apartments with satellite TVs, kitchenettes, internet access, safe deposit boxes, shared laundries and private balconies with views of the downstairs swimming pool. 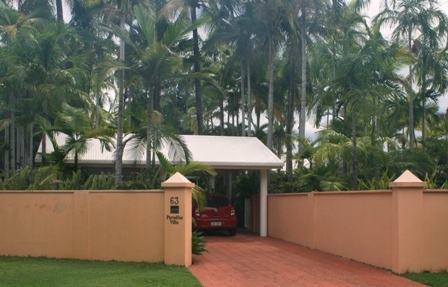 On this page you have Port Douglas bed and breakfast accommodation. There are a fair few places for the town of its size, some are central while others are outside. On this page they are sorted after location and the most central ones come first, but it does not mean that the places further down the page are worse in any way - they likely offer even more seclusion and privacy. 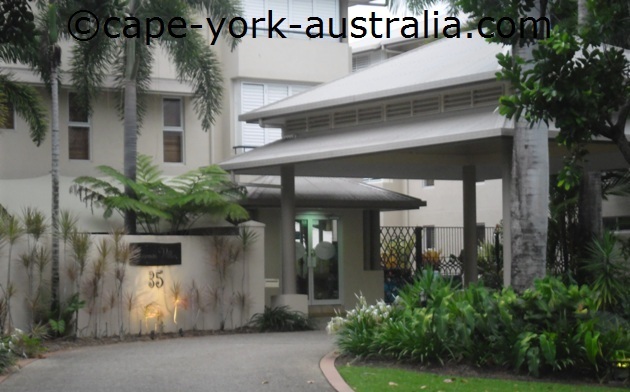 This beautiful accommodation is right in the centre of the town, literally a few steps to Macrossan Street. There are two different buildings - a private cottage with one bedroom and kitchen, living and pool area; and a two bedroom lodge with kitchen, dining/lounge area and a pool outside. 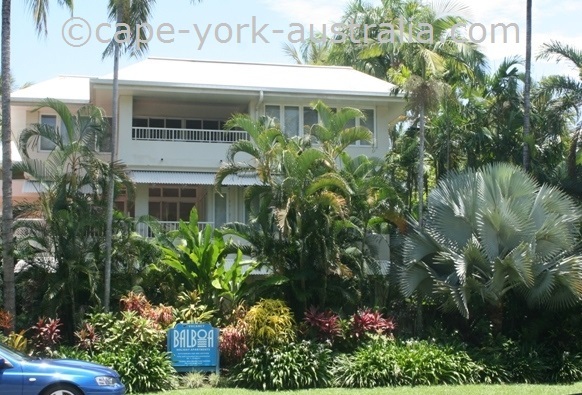 The following Port Douglas bed and breakfast places are located a little south of the town centre, but close to the beautiful Four Mile Beach. This place has open plain living on the ground floor (with TV, bar fridge, tea and coffee making facilities), and doors opening to the garden, BBQ and entertainment area, and a swimming pool. Upstairs are three bedrooms all with own ensuites and private balconies. Continental breaky, and use of bicycles included. 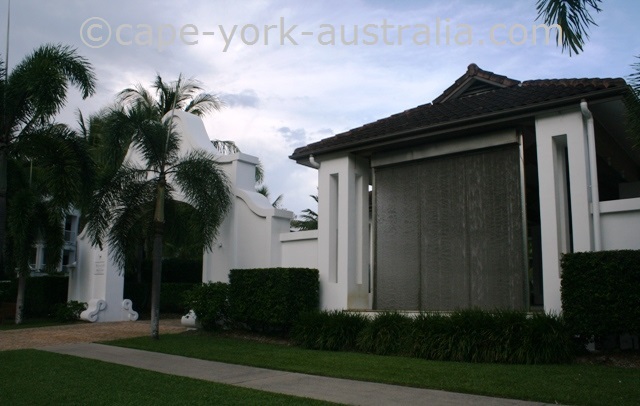 This villa is in the southern end of Four Mile Beach. It caters for one couple at the time, and has a self-contained guest wing suite half villa with a queen bed, own toilet and bathroom, a TV, lounge, and overlooking the garden and swimming pool. There is also an outdoor dining area with BBQ. Not far from the place above, this bed and breakfast accommodation has two double bedrooms with queen beds, fans and air conditioning and ensuites. There is also an outdoor area with lounge chairs, a courtyard and a swimming pool. Wifi, beach towels, and breakfast like other places. 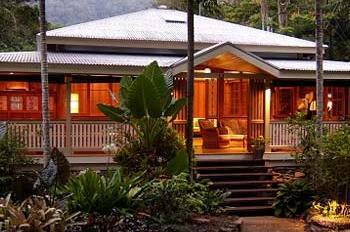 The following Port Douglas bed and breakfast places are a little outside the town. Just north of Port Douglas along the Cook Highway, Birdsong is a large place with own chef that can cater for a lot of people and is popular as a wedding venue, but also has large, nice and not overpriced bed and breakfast ensuite rooms, a movie theatre and a swimming pool in tropical gardens, and the breakfast is made by a chef. 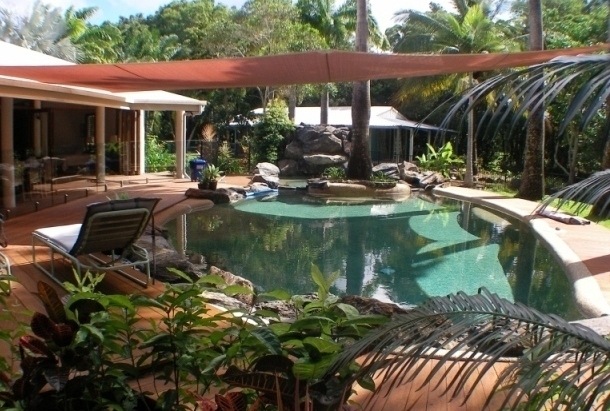 This private guest house is south of Port Douglas. It is a Queenslander style timber building with wide verandahs, a self contained kitchen, three bedrooms and two bathrooms. 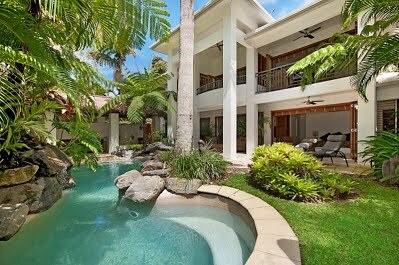 There is an outdoors enterainment area and a saltwater swimming pool in the tropical landscaped gardens. 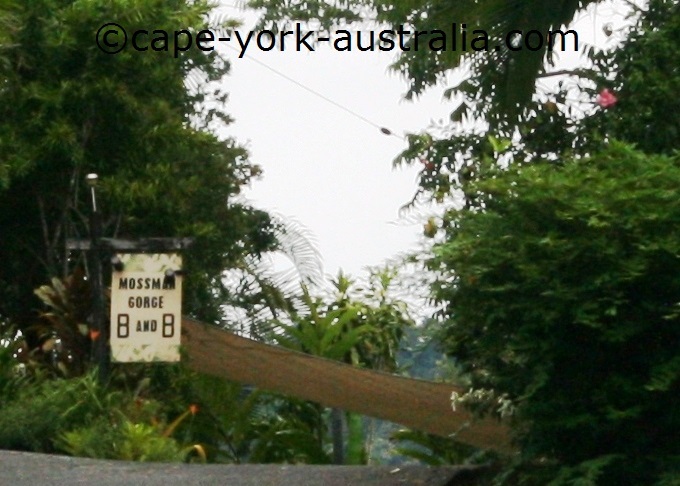 The following Port Douglas bed and breakfast places are near Mossman. This private wooden guesthouse has two fully screened ensuite bedrooms with own entrances, king size beds, fans and a/c, TVs, DVD players, WiFi, bar fridges, tea and coffee, and a deck. In the tropical garden there is a swimming pool. Breakfast served on the deck, massage available. This modern tree top timber home has the whole top floor for guest space. It has two fully insect screened ensuite bedrooms, a/c and ceiling fans, open plan outdoor and indoor dining and living areas, large verandas, fridge, microwave and utensils, tea and coffee making facilities, BBQ, hammock and a saltwater swimming pool. 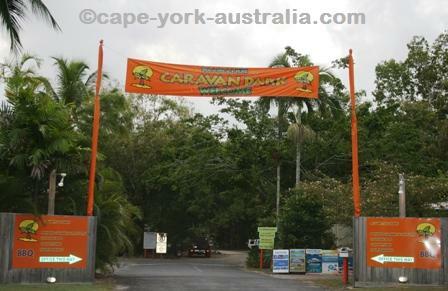 On this page you have all the Port Douglas caravan parks. 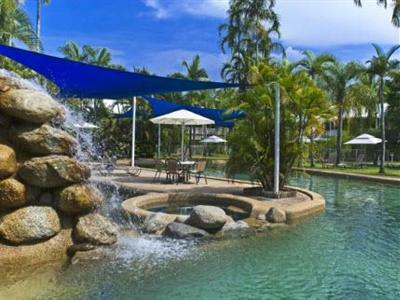 Although camping is not the most usual kind of accommodation in Port Douglas, there are three parks in town and one outside, which is not altogether that bad for a small town that Port Douglas is. Each one is different, and what you like depends on what's the most important thing for you - the location, the space, or the price. 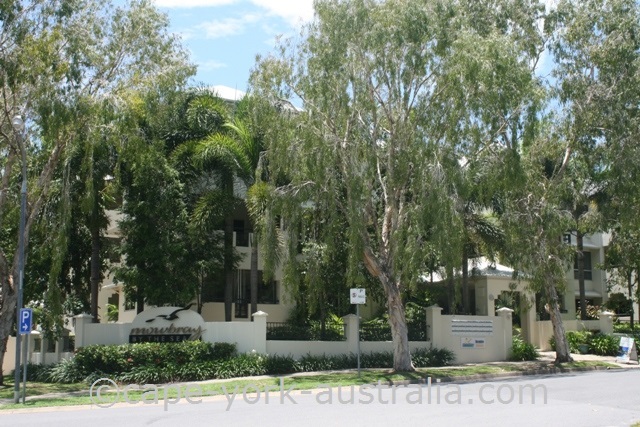 This is the most centrally located of all Port Douglas caravan parks, a short walk to the beach and the Esplanade, the town centre and Macrossan street. 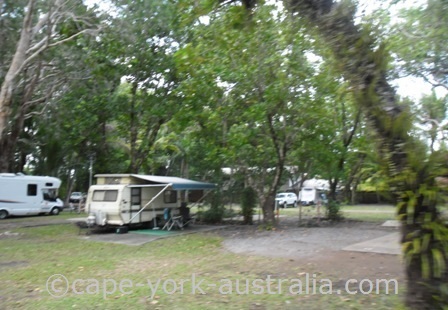 Powered and unpowered sites, camp kitchen, swimming pool, great location but not the cheapest park in town. 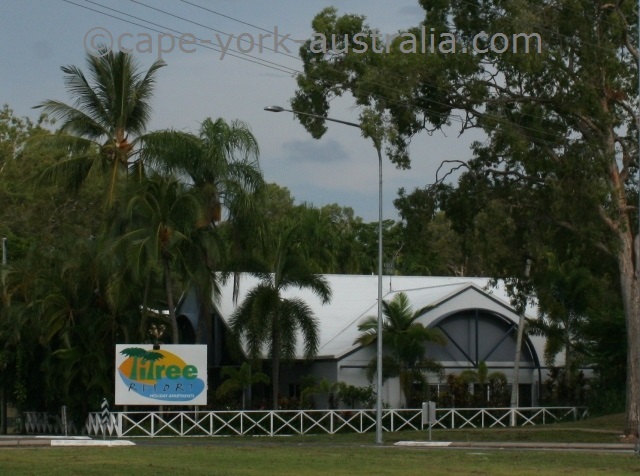 A bit further out from the town centre but along the same road as the Tropic Breeze, Pandanus park often has their three-day specials which is not a bad value. Powered and unpowered sites, self contained cabins, a camp kitchen, a saltwater swimming pool, and free gas BBQs. 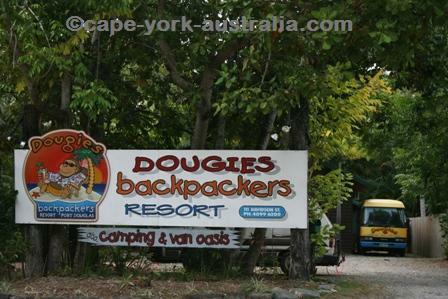 Next door to the park above, Dougies has a camping ground in the back. It is small and often packed, with no distance to other campers, but if you are young and don't mind, and the price is the most important thing - this is the cheapest place in town. Friendly service, there are rooms as well. 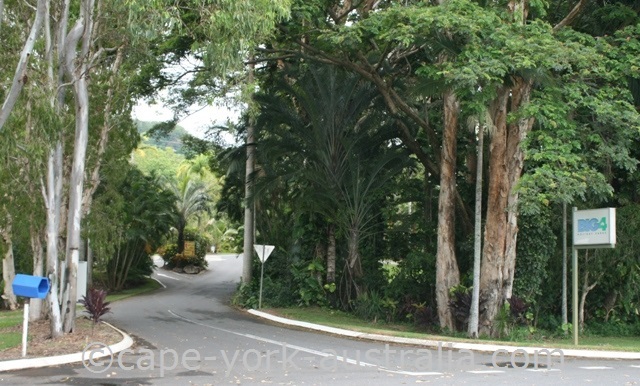 This park is outside the town, just south of Port Douglas' southern suburb of Craiglie. 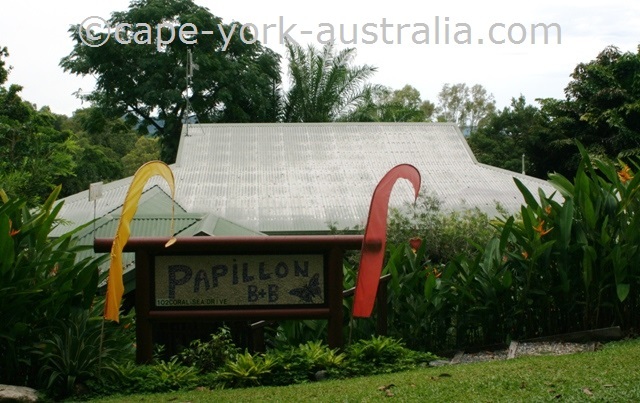 It is one of the nicest Port Douglas caravan parks, spacious sites, cabins, BBQs with tables and a swimming pool, friendly service, but it's obviously nowhere near the walking distance to the town, and it is not cheap. 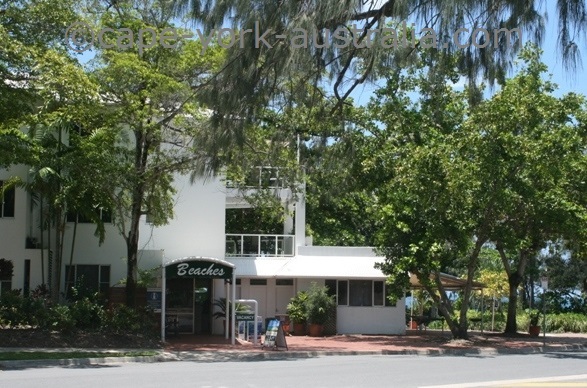 On this page you have Port Douglas backpacker hostels. 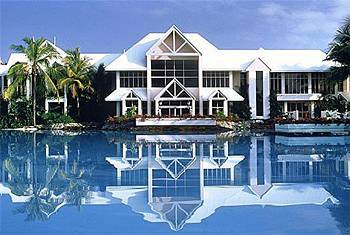 There are not many of them, since Port Douglas accommodation mostly consists of expensive hotels, resorts and holiday apartments. But the few backpacker hostels that are there, are clean and reasonably cheap places to stay. 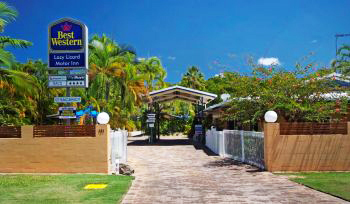 Parrotfish is in central Port Douglas and it has dorm rooms and double rooms, internet cafe, a communal kitchen, a TV room, fans and air conditioning, a swimming pool, a poolside BBQ area, 24 hour reception, laundry service, off street parking and airport shuttle. 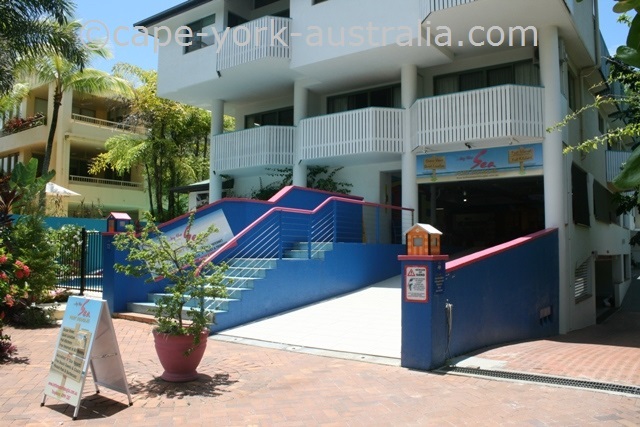 Global Backpackers has the advantage of a great location on Macrossan Street. 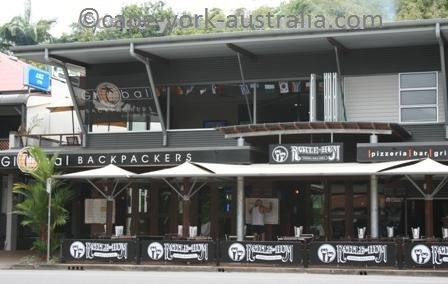 Global Backpackers is a well known chain and this place has dorm and double rooms, air conditioning, internet, 24 hour security, an outdoor smoking area and free luggage service. 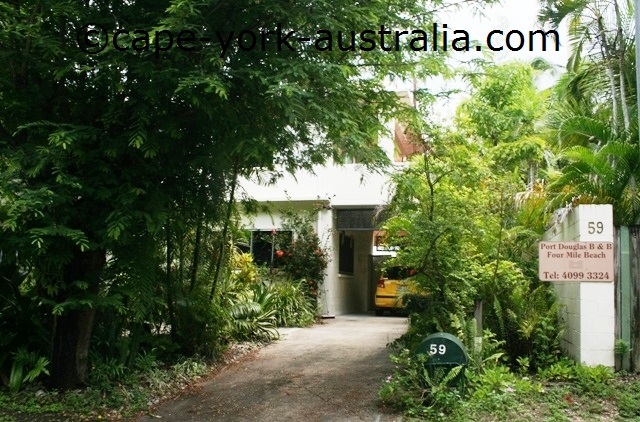 Port O Call is a bit away from the city centre, but it is not far and it's good value. There are dorms, doubles and twins, a tropical swimming pool, a bar and a bistro, a communal kitchen, an outdoor tropical swimming area, a TV room, internet, pool table, free luggage storage and free parking. Dougies is even a little further out, but it makes up for it by very friendly staff and good facilities. It has dorm, twin and double rooms, and in the back yard is a camping ground, albeit small but cheapest in town. There is a self catering kitchen, hammocks and sun lounges, and a swimming pool. 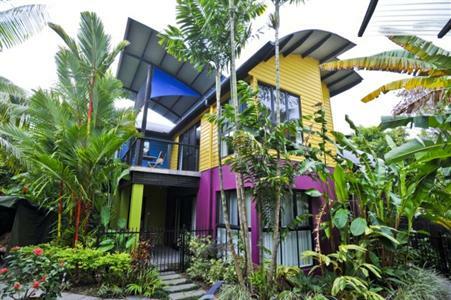 On this page you have some budget accommodation in Port Douglas. And there is not a lot of it. The town is a luxury holiday destination, and most of the accommodation is not cheap. Below are some places that are cheaper than others, starting with the more central ones. 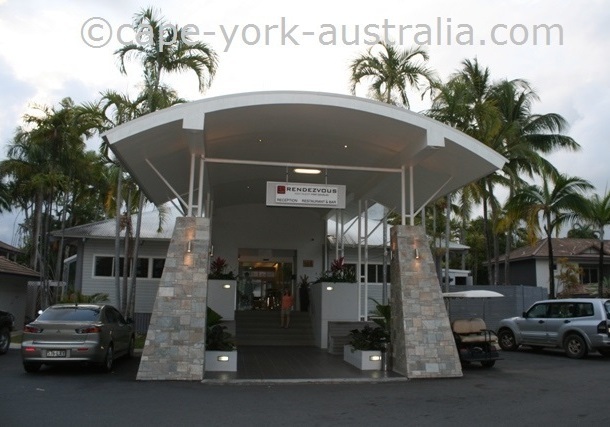 This three and a half star hotel is another budget place to stay in Port Douglas. 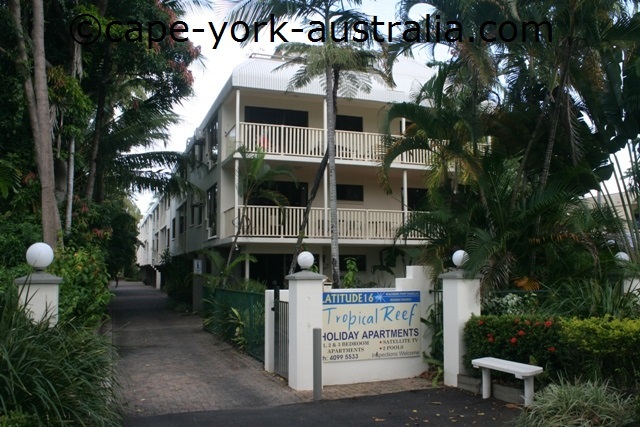 It has self contained studio apartments with kitchens and balconies or outdoor patios. 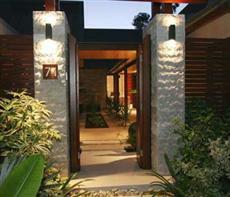 Outside is a large garden with a swimming pool, a rock waterfall and an entertainment area with BBQs under a gazebo. 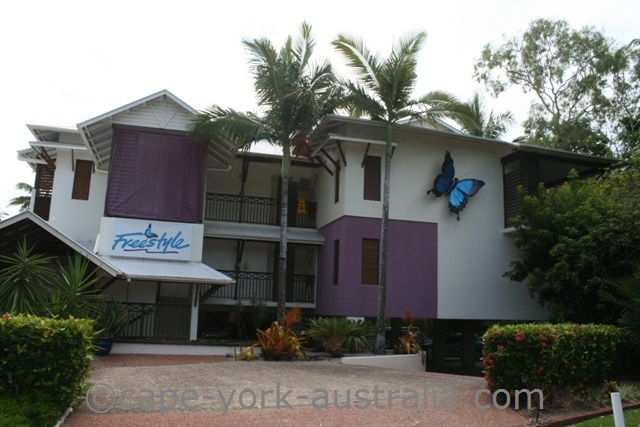 This motel is in the central Port Douglas and has accommodation for affordable prices for budget travellers. It's still not cheap-cheap but it doesn't cost you an arm and a leg. 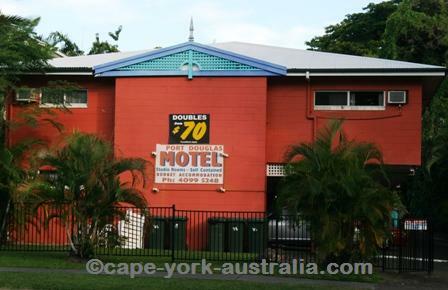 There are motel rooms and self contained studios, BBQs, a swimming pool and guest laundry. This is another budget option. It has one, two and three bedroom apartments with kitchenettes, lounge rooms, private bathrooms and private balconies. There are also deluxe and superior units with a second bathroom. In the gardens there is an entertainment area with a BBQ and a swimming pool. The two star Best Western Lazy Lizard targets budget travellers. It has 22 units with private bathrooms, air conditioning, IDD phones, TVs, large beds and hair driers. There is a swimming pool, a steam room, spa, and an onsite restaurant.